Is there a bodybuilding gene? The affects of MSTN. MSTN is a gene that makes instructions for producing the protein myostatin, a protein that is part of the transforming growth factor beta family (TGFβ). The TGFβ family of proteins control the growth of tissues in the body, myostatin is found nearly exclusively in the skeletal muscles where it is active before and after birth. The protein actually controls skeletal growth by restraining it, preventing muscles becoming excessively large. Current research that surrounds myostatin is based around its potential treatment in muscle wasting disorders, animals that have mutations in the encoding gene MSTN show greater muscle mass, strength and in some circumstances reduced bodyfat, which can be known as myostatin-related muscle hypertrophy. This study aimed to see the prevalence of mutations in the male bodybuilder population (n = 92) and if having a mutation had any affect on their muscle size and/or muscle performance. The study which looked at mutation prevalence in rs1805086, arm circumference, pull-up max and push-up max. 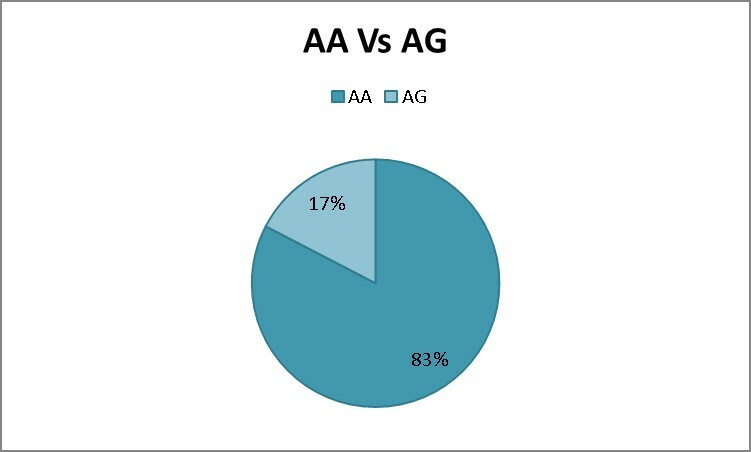 The results show that 17% (16) of the subject group had one mutation (AG), 83% (76) had the common outcome (AA) and 0% (0) had two mutations (GG). Those with the AG outcome had an average arm circumference of 46.37cmcompared with AA which had an average of 42.02cm. Those with the AG outcome had an average pull-up max score of 21 compared with AA with an average of 12. Those with the AG outcome had an average push-up max of 61 compared with AA with an average of 40. The study clearly shows that those with a mutation are rare, however the mutation does appear to give the subject a performance and size advantage over those with the common outcome. This is a study based on the extracted data from an anonymised data bank of genetic and individual data, it is aimed at building a basis for research on the gene MSTN and how it interacts with athletes. The study aims to discover if the gene MSTN, in particular mutations in the SNP rs1805086 have any impact on the male bodybuilding population (n = 92) from a muscle hypertrophy and muscle performance standpoint. The secondary aim is to speculate if rare mutations are more prevalent in those who decide to choose a sport such as bodybuilding, as research indicates that mutations in MSTN can illicit larger muscle mass and a reduction in bodyfat. Pull-up max – As many full pull-ups (palms pronated) as possible before having to cease (let go of the bar). No straps were permitted. Push-up max – As many push-ups within one-minute, full push-ups. Arm circumference – Measured arm circumference when arm is flexed. This data is added to already collected data and the genetic outcome for rs1805086. Table 1. Data set for study. Figure 1: Averages for the bodybuilding population. This look into specific collated data has shown that the mutations in the gene MSTN may illicit advantages for those in bodybuilding and sports in general due to an increased muscle performance and apparent muscle size. A deeper look into a greater number of subjects will offer a greater insight into how much impact this one gene may play in sports and the general populous. A full follow-up study with lab controlled subjects during performance testing and in a greater number is recommend to draw firm conclusions.